Postcard from Naples 9 - The card is identified as "The Thermal Baths of Agnano, Naples, view of the main facility." This is the area in the Campi Flegrei, west of the main body of Naples, where there used to be a lake, Lake Agnano. The complete story is here. This is where Mark Twain found the Grotto of the Dog and started looking for pooches to suffocate in the poisonous fumes! In any event, the lake was drained in in 1870 as part of a long-term project to reclaim land and manage water resources in the area. (Indeed, if they stopped managing and reclaiming, you'd wind up with another lake in no time!) New canals and drains were added over the decades, and in 1934 the Consortium for the Reclamation of the Agnano Basin was set up to oversee and continue work. Quite recently (2003) that consortium was expanded to include "...and the Flegrean Basins" for a total area of some 5,600 hectares (about 20 sq. miles). Indeed, today you can stroll along the channels of the Agnano basin and watch the dark, mineral-laden waters still wending their way towards the Fount of Apollo. Interestingly, the lake was not ancient Roman or Greek such as some of the other bodies of water in the area. The area had been an active thermal bath area, but not a lake. It then swamped up 1,000 years ago and the baths disappeared. With the draining of the lake in 1870, the thermal springs again became available, and for many years there has been a spa, a thermal bath establishment, the Terme d'Agnano, just below Mt. Spina at the southern end of the basin. 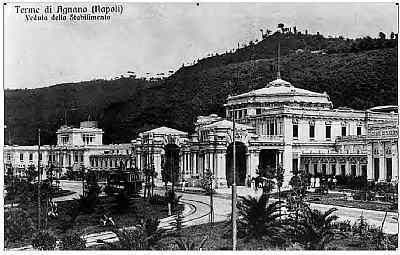 The Agnano baths were at their height of popularity in the 1920s; the hotel and baths were housed in one of the grandest examples of Art Nouveau architecture in Naples (postcard photo, above - approx. date 1920), built in 1910/11 and designed by Giulio Ulisse Arata. During WWII, the spa quartered the officers and nurses of the US 21st General Hospital, which was stationed there and at the nearby Mostra d'Oltremare fairgrounds from December 1943 to September, 1944. The area degraded terribly after WWII and became an eyesore from shoddy overbuilding and illegal waste dumping. The building was demolished in 1961 and replaced with the current facility (pictured, left), an example of Brutalist architecture—an unadorned concrete box. It was designed by Giulio De Luca. Parts of the old Arata building are still standing far to the left of the old main entrance. There is some plan to restore them, but I don't think that is going to happen. Maybe they should make what's left into a monument to the stupidity of tearing down functional buildings just because architectural tastes change. The counter-argument is that the modern building is much easier to maintain—all you need is a sponge, sand-paper, and a putty knife. Art Nouveau architecture was, indeed, very ornamental, and the more skirts, brackets, and pilasters you have hanging off of a building, the greater the likelihood that a piece is going to break off and kill someone. (That can happen and has happened recently in Naples.) So they made their decision in 1960 to tear it down. On the other hand, there are a great many smaller examples of Art Nouveau buildings in Naples that are properly maintained, and they remain a pleasure to look at. This area, the Agnano baths, now seems to be in a sort of perpetual limbo... on again, off again money problems and labor-management disputes. It's too bad, but that's typical around here.